Charleswood is home to the Charleswood Hawks, the Charleswood Curling Club, and to a continental climate that will put your HVAC systems to the test all year round! Much like the surrounding Winnipeg area, Charleswood residents are continually battling between high levels of summer humidity and low winter temperatures. Severe weather changes can seriously take a toll on your units, increasing the chance of malfunction or broken parts. Lucky for Charleswood patrons, Provincial Heating & Cooling has a team near you, ready to fix your heating and cooling troubles when you need us the most! With over 20 years of experience, Provincial Heating & Cooling is proud to be a leader in our industry. We truly value our customers, providing first-rate services on every job. We also value our communities, using environmentally friendly products and equipment to keep our neighborhoods healthy and safe. 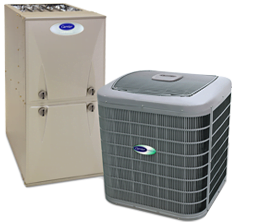 Provincial Heating & Cooling is a Carrier Factory Authorized Dealer for the world-class Carrier products- the home heating and cooling experts any HVAC professional would turn to. After complying with rigorous standards, our professional air conditioning contractors Winnipeg residents have access to, is armed with the best equipment and techniques available to fix even your toughest of HVAC problems! Just like the weather in Charleswood, system errors are rarely predictable. When your heating or cooling systems are not working correctly, the effects on your lifestyle can be severe. Sudden changing temperatures can affect your sleep, your mood, and your health, especially if you have a chronic condition. Knowing this, our staff at Provincial Heating & Cooling is dedicated to getting your systems up and running again as soon as possible. We offer 24hr services specifically for those inconvenient malfunctions that will always happen after normal business hours. Provincial Heating & Cooling is in the business of providing quality services, not in causing our customers stress! That’s why we offer our customers the Pro Service Plan, an affordable and convenient agreement allowing customers to get the most out of our exceptional services. Benefits of the plan include preventative maintenance of units, reduced repair costs, priority service, and most importantly, a 100% Satisfaction Guarantee. Whether it’s a residential or commercial space, our customers can have peace of mind that their systems are accurate, approriate, and of the high standards expected every time. Charleswood residents, don’t wait for your system to go on strike during the worst heat or chill of the season. Contact us today for your free estimate on your heating and cooling needs today! We are very happy with our new furnace. The installers were polite and respectful and very patient with our questions. Their prices are very competitive and Gavin expands everything so well in quoting without making you feel like you have no idea what he’s talking about. I would totally recommend them. I also like the product and the fact that you can get parts in Winnipeg. We have also noticed a difference in heat distribution since it was installed.